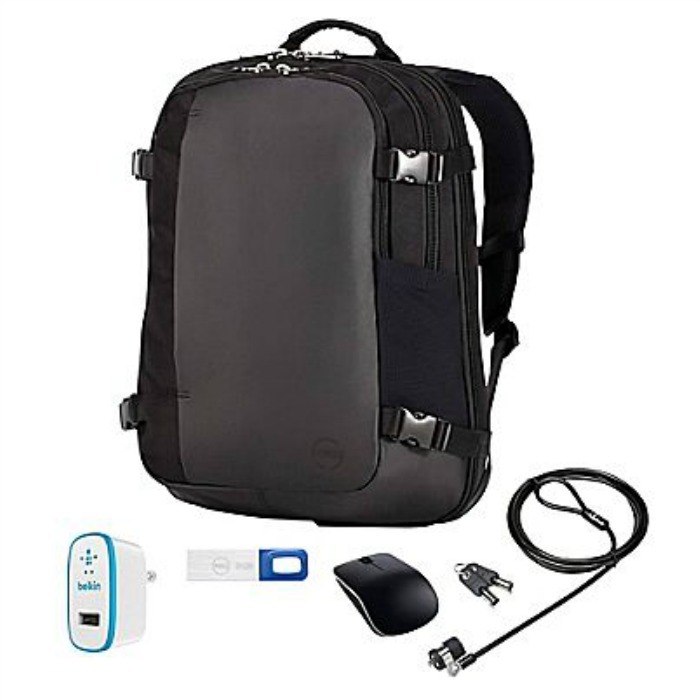 Dell Backpack Premier PC Accessory Bundle Just $29.50! Down From $200! You are here: Home / Great Deals / Dell Backpack Premier PC Accessory Bundle Just $29.50! Down From $200! Staples has this Dell Backpack Premier PC Accessory Bundle on sale for $29.50 (Reg. $200)! Deter thieves from stealing your laptop and the personal information in it with the Dell Combination Lock. 8GB USB flash drives allow you to save documents, share photos, music, videos and more. The Premier Backpack features a TSA Checkpoint-Friendly design and an internal pocket that allows you to charge your laptop, tablet or phone while on-the-go, without taking it out of the bag. The wireless mouse can manage up to six total unifying peripherals and has up to 18 months of battery life so you can travel with confidence. You can count on features like a T-bar locking mechanism, carbon-strengthened steel cable, and a tamper-resistant lock head for the ultimate connection between lock and computer. The compact cable makes the Dell Combination Lock easy to take with you to wherever you take your laptop: school, home, library, coffee shops, etc. Program your own lock combination from over 10,000 possible 4-number codes, and reset the code whenever you wish. The T-bar attaches to the industry-standard Kensington ‘K-slot’ security slot found in the majority of Dell computers and hardware.